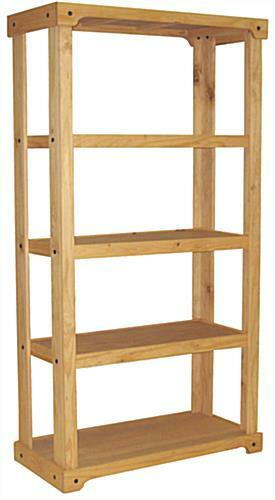 Made with a solid pine frame, this wood shelving unit brings rustic charm to any home or store. 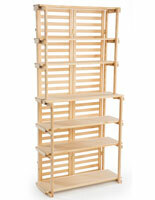 The open fixture with 4 tiers has a deep oak stain to accent products and valuables held upon the 3 ledges. 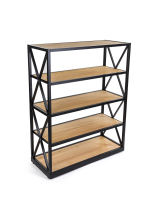 With exposed sides, this 4-sided wood shelving unit lets customers easily access the items on display while also providing you a means to quickly restock. 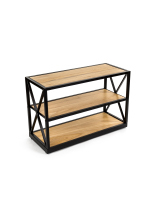 To make things even easier for your customers, the backdrop is left exposed so you can place this open fixture in the center of your store or café for a beautiful, approachable display. 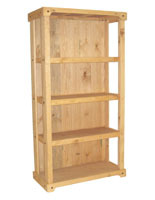 Easy to assemble, the solid pine stand is made for quick installation and use. 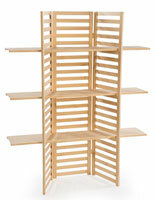 For a natural display case that will look great in your home or store, add this shelving unit to your decor! 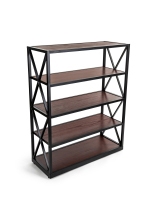 29.0" x 72.0" x 18.0"
- the picture online showed beautiful pine, the unit that we received has a lot green discoloration throughout the legs - the picture online showed beautiful stain color, the unit that we received is a very dull matte finish - when assembling the unit, I've got 5 would slivers in my hands. 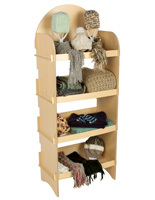 We are very sorry that you were not fully satisfied with the quality of your order, Colleen. 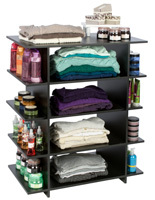 A customer service representative will contact you shortly.